Bowser Stadium is an arena found in Super Duel Mode from Mario Party 5. The arena resembles Bowser Castle and is filled with magma around the edges and in the center, making it one of the few courses barring Random Ruckus to have a unique stage hazard. 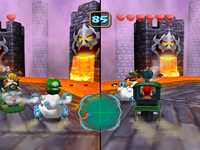 The magma takes away one heart if the player touches it, unless the vehicle is equipped with the Lakitu Cloud or the E. Gadd Jet tires. Battle on a stage surrounded by dangerous hot magma! This page was last edited on March 20, 2018, at 09:24.